Events open a whole new horizon of possibilities to motivate your sellers to surpass their goals. Think of an event as a celebration when a key milestone is reached in your company. Whether when a seller completes his sales budget, breaks a sales record or closes 10 sales in one day, you are given the tools to create custom events that matter to your organisation. Events also include screen announcements, custom soundtracks, badges and experience points (XP). You and your teammates are going to love it. SalesScreen offers 2 categories of events: Automatic events and Scheduled events. Automatic events are events that are triggered right after a report is added to SalesScreen, given that their conditions are met. 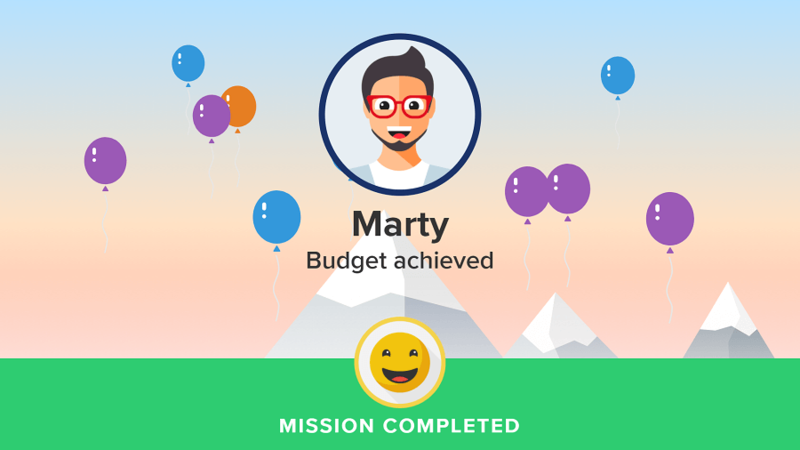 Budget progression: When a user, a team or your entire company reaches certain percentage of the current assigned budget. Example: Team reached 120% of his sales budget (in value). Example: User has reported an offer sent between 18:00 and 23:00. Single report: When a user adds a report with a value or quantity higher than a specific goal. Combined reports: When a user, a team or your entire company adds reports within a specific timeframe and whose sum of values or quantities are higher than a defined goal. Single record: When a user adds a report setting a record of the highest value or quantity ever reported in one single report. You can pick whether it is a personal, team or company record. Example: User reported a personal Sale record (In value) on Product A. Example: Company surpassed the Sales results (in Value) from last Week. Scheduled events are however scheduled to be triggered at a specific point in time. Example: The company's best seller of Product A for the week will be announced the following Monday at 08:00. What happens when a event is triggered? For each event, you can customise how the seller triggering it is awarded and how the event is announced. Event award: You can pick which badge will be awarded to the seller as well as how many XP (Experience points) are granted to this user upon triggering of the event. Event Announcement: You can decide where and how the event will announced. If you choose to announce the event on screen, you can choose the layout, soundtrack and duration of the announcement.